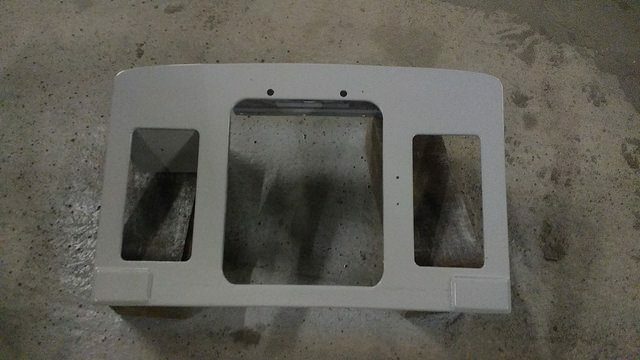 This time its the series’ front panel (the panel behind the grill, between the wings). 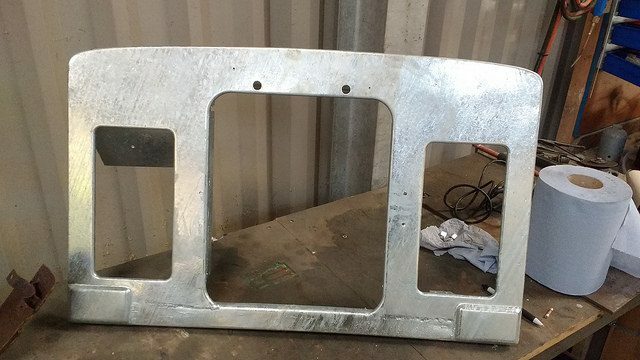 The bottom section of this panel is reinforced with a piece of steel angle on the rear. 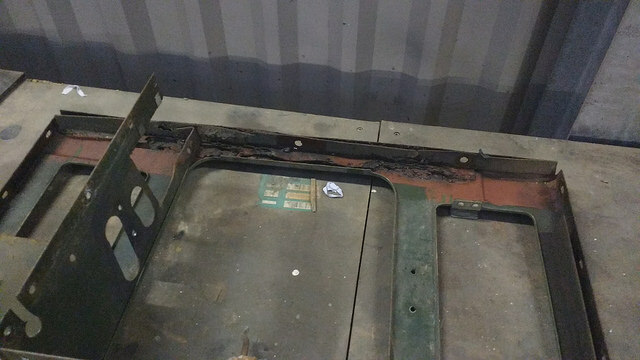 This traps water behind the panel and causes it to rust through. 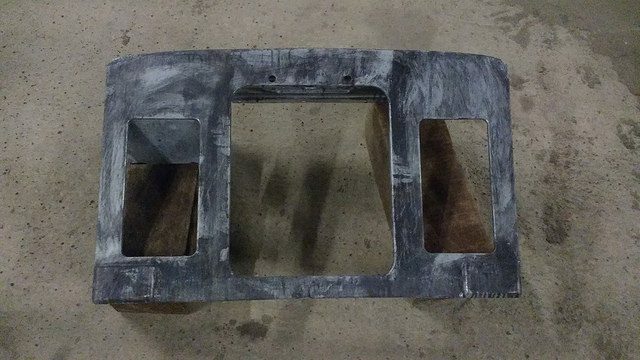 With the front ‘apron’ panel fitted (removed in these pics for behind-bumper standing room) this can go unnoticed. Structurally it’s not really a problem unless it’s so bad the radiator falls out and the wings are flapping in the breeze, but it’s not pretty. 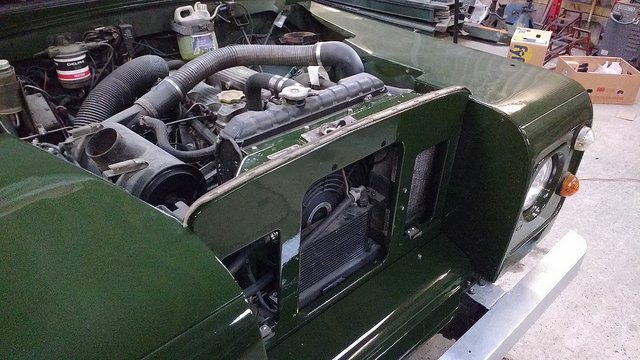 The radiator and various other bits and pieces are mounted to it, so they needed to come off first. 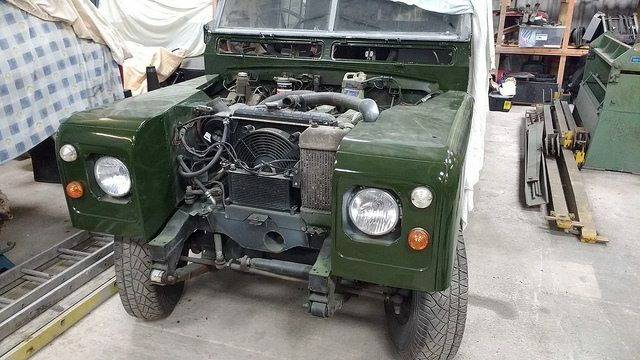 This one also has an oil cooler and intercooler fitted for the ex-Range Rover 200 tdi engine, so there’s not much room behind there. 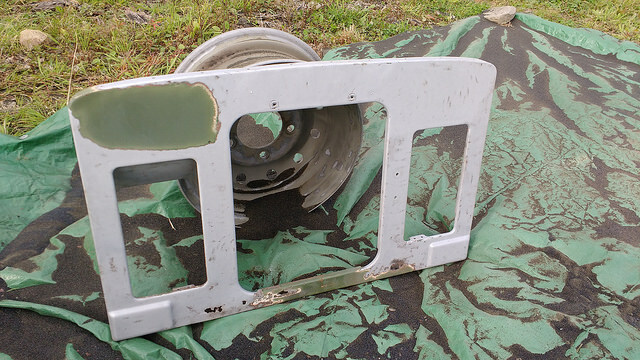 The wing to front panel fasteners can get pretty rusty, thankfully this 109 was in bits recently so everything came apart easily. 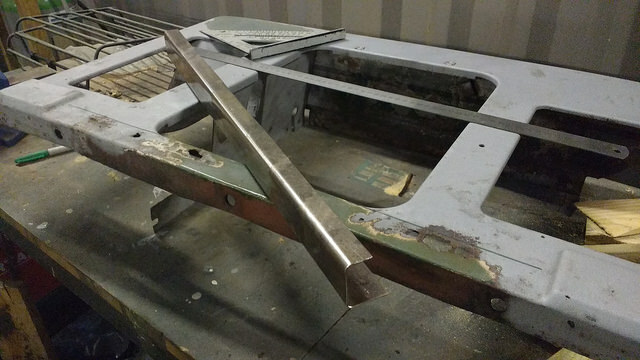 Note the bolt retaining plates sat on the wing – these hold the wings to the front panel. 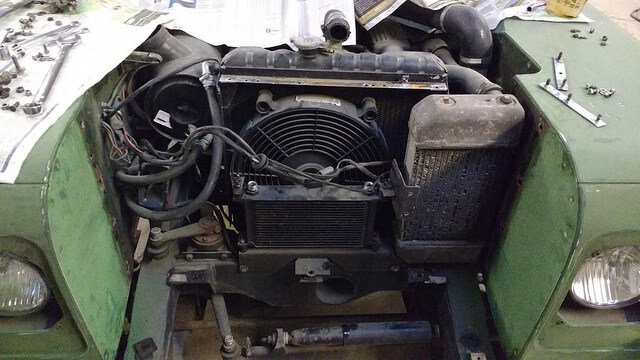 When I first dismantled this 109 those had been replaced with normal bolts, which made removal a total pain as the heads were buried down behind the radiator. Much easier this time round. 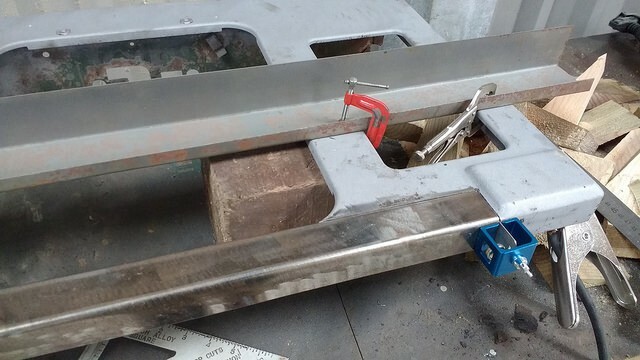 Once off, a few choice taps with a chisel were employed to see how bad it was. 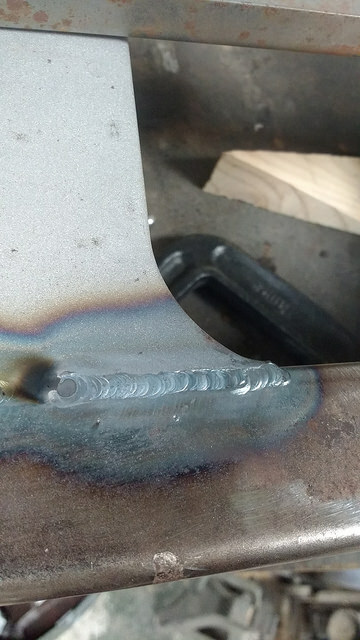 This opened up a few holes, but other than the lower edge it seemed pretty solid. A quick skoosh with the shot blaster next showed exactly how far the rust extended. The two bottom corners (with the pressed sections sitting proud of the rest of the panel) were sound enough. 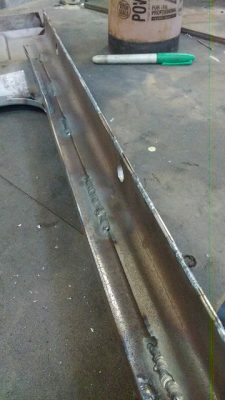 This was good news – the repair would only need to extend out to those pressed areas, making the repair fairly straightforward. 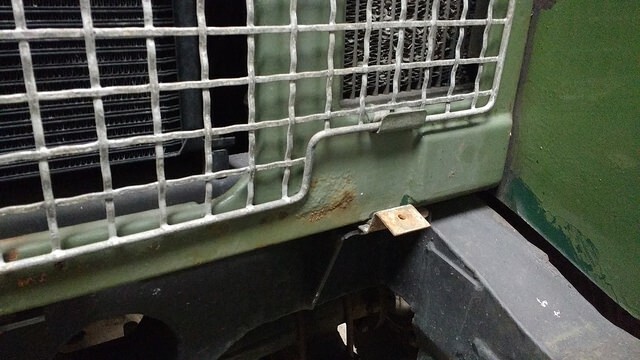 the old rail was then cut out in line with the bottom of the radiator opening. 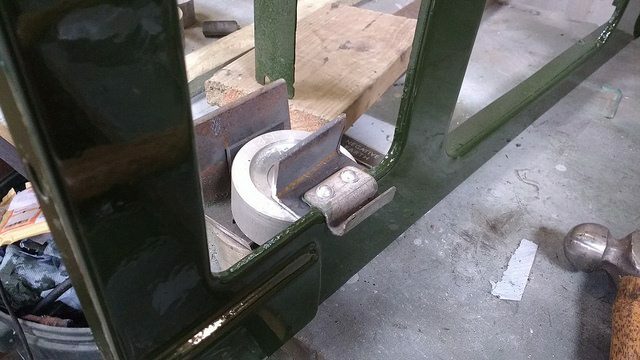 The existing curves into the bottom rail were retained, which made things easier than having to make curved repair sections. 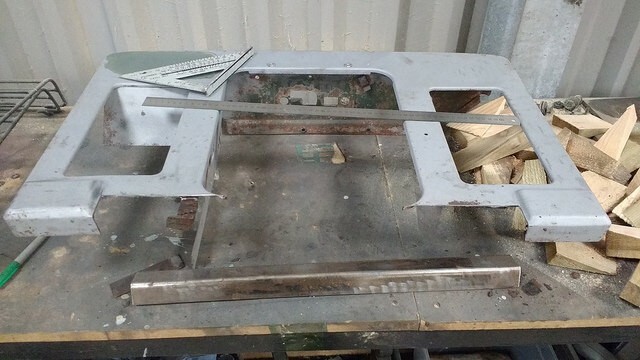 A further bent section of thicker (1.8 mm) sheet was attached on the back per the original, before drilling the 3 mounting holes to attach the panel to the chassis. 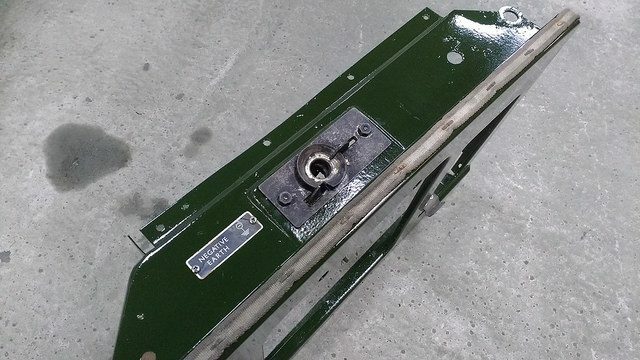 With that done and the rest of the paint blasted off, it was sent off for galvanising. Note how the galvanising makes the weld line really obvious – that’ll lessen once it’s been prepped and painted. Along with various other bits. 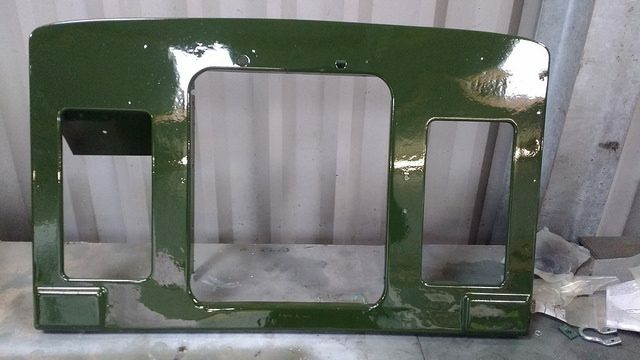 Various other bits had been resprayed in the meantime as part of the 109’s ongoing respray, so it’s starting to look pretty good (albeit a bit dusty in this pic). 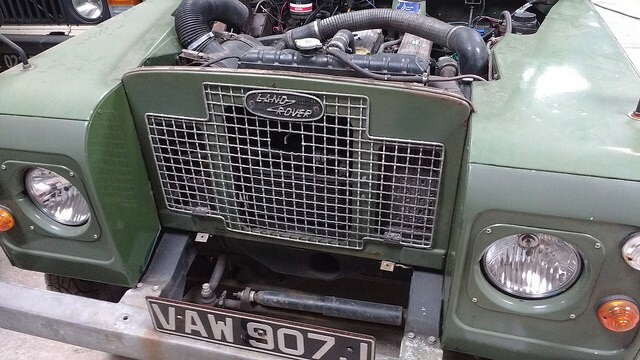 The bonnet catch is only loosely attached, it’ll get adjusted once the bonnet is back on. 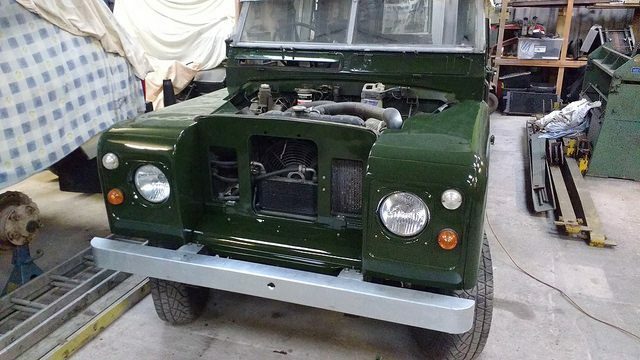 The grille will then go on last. Jobbed.